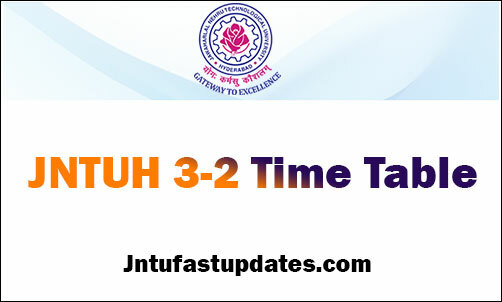 JNTUH 3-2 Time Table 2019: JNTU Hyderabad B.Tech 3-2 Sem R16, R15, R13, R09 Regular/Supply Time Tables May/June 2019. Students who are going to appear for the JNTUH 3-2 sem examinations 2019, can check the Regular and Supplementary time tables from the official website, jntuh.ac.in. Jawaharlal Nehru Technological University, Hyderabad (JNTUH) has announced B.Tech 3-2 Semester R16, R15, R13, R09 Regular/Supplementary Examination time tables May/June 2019. Students can check their JNTUH 3-2 time table R16 or JNTUH 3-2 time table R15 or JNTUH 3-2 time table R13 from below links. Jawaharlal Nehru Technological University Hyderabad one of the oldest universities of Telangana state. The university is contributing its services to the education sector from 1965 onwards. JNTUH is one of the largest universities of the state level public universities. It offers various UG and PG programs for the students. Also, the university offers affiliation for various colleges. Hundreds of colleges/institutes are working under JNTUH. The university maintains quality standards in the education sector. The University organizes examinations in the semester system. JNTUH is going to conduct the 3-2 Semester Regular/Supplementary examinations in the month of May/June 2019. Hence students of 3rd year 2nd semester and students having backlogs can check the JNTUH 3-2 Time table 2019 below. The B.Tech 3-2 Sem regular and supplementary exam will be conducted by the university in many of the JNTUH affiliated colleges. Hence students pursuing the B.Tech 3-2 Sem can check the time table for R16, R15, R13, R09 regulations to appear for the examinations. JNTUH has released the time table for B.Tech 3-2 regular and supplementary Examination of R16, R15, R13, R09 regulations. All the students pursuing 3rd year 2nd semester can download the time table/routine/ date sheet from the JNTUH official website, jntuh.ac.in. Visit the website; on the homepage, the aspirants can find the exam date sheets. In which, click on 3-2 time table link and go through the exam dates. The time table will be released in PDF format. Check all the dates and take printout for further reference. 3. In the recent notifications, students can find the link of JNTUH B.Tech 3-2 time table 2019 May. SIR RELEASE CHEYANDI SIR TIMETABLES R13 REGULATION…KANISAM DATES AYINA TELUSTADI SIR APPUDU UNTADI ANI…NO TIME SIR TO PREPARE FOR EXAMS…. ANY POSTPONEMENT OF EXAMS?REPLY SIR…. Sir evertime before 1 month u release the timetable sir.exams are from 6th may means on April 5th u realease the timetable now remaining 20 days left for exams.when u will release the timetable for R13 regulation….SIR ANY POSTMENT OF EXAMS?REPLY SIR…. When exam schedules are going to release,please reply as soon as possible! 75% attendance not required said by supreme court is it true?